Dennis and Peggy own a fine restaurant in the center of old Gloucester. Dennis is making chicken soup for the restaurant this morning and I will have that with crusty French bread and butter for lunch.. The restaurant is Halibut Point in a historic building. Here are pictures of some of my treasures gathered this past week. The indigo and white coverlet has had the fringe cut away in some misguided effort to neaten it. The strong graphics are undiminished and carry it still as an interesting early textile for those of us who love them. My friend Penny has been in Vermont this past two weeks weaving a plaid blanket for her home. I cannot wait to see it! 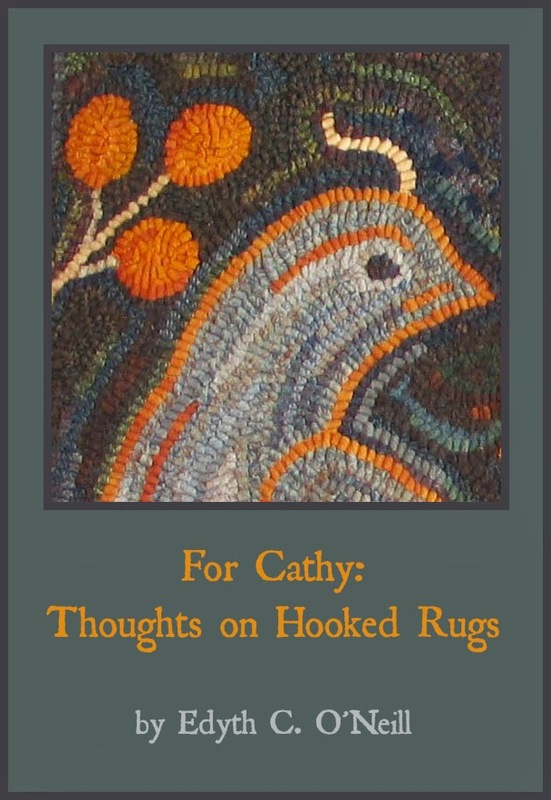 Peggy's sister Cathy is a very productive weaver even with a lot of family still at home. Cathy made the two little mats in salmon and green, I am delighted to have them to use under feather trees at Christmas. The little blue doll socks and the blue doll dress and the delft tile give you a hint as to one of my favorite colors. The doll shoes are a gift from Peggy and will go home to one of my Greiners.. Also destined for the doll cabinet is the small sampler dated 1794. Another day of sunshine. Driving west inland the trees are showing more color. Barbara, Peggy and I went to an outdoor show, decorated with fall things, then to the Angel House shop, and two shops in Sturbridge. Missing below is a picture of the coverlet I bought, a bit rough but with eagles not to be resisted. Diane Halprin of Townsend Mass was set up there and we visited her some. This was more of a primitive show than the three of us wished. Still there were many cross over pieces, some nice early redware, chairs, and my coverlet among them. Two hours at sunset... tomorrow a little country antique market. You can always click on a picture to see it larger. Amazingly the stunning bright fall weather is holding! This Thursday morning Peggy and I set off for Bridgewater Massachusetts, over bridges and through tunnels and engulfed by the mighty traffic of Boston. Our destination was the home of doll collector Cyndi B. She and her daughter Jen are making a study of the molded linen head dolls from the mid 18th century. Cyndi has three examples of these rare dolls and is writing an article on them as have I. My pictures and thoughts on them are posted on Maida at present and I am expanding on this for a future presentation. Neither of us yet has real evidence where and by whom these mystery dolls were made. All of this week there have been film people set up in Rockport. We saw them working near where I was painting from a pier earlier. This Thursday as we drove to Cathy's home and her guest house where I am so happily nested, right up to Cathy's driveway we found the crews and their equipment working here in the woods. This will be used in an HBO series by the name of Olive Kitteridge. I want to watch for this one. The trees are showing some autumn color here and there. Barbara, Peggy and I drove a little way up into NH stopping at favorite shops, Fern's, Austin's and Parker French. I was thrilled to be in old haunts I never expected to see again. I bought small and with the thought that anything purchased must be mailed home, but I enjoyed all of it. 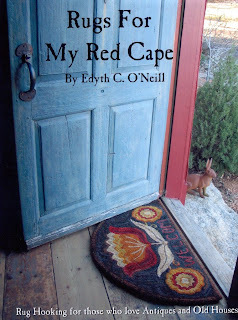 Purchases included an old book of the white pine series showing Peggy's house. Also bought was a small framed sampler or at least a piece of cross stitch, and a deep indigo doll dress. The dress is hand stitched with old brown thread. Another item for the doll family is a tiny pair of robin's egg blue doll sox. Tuesday was another golden day. The light in Rockport is so special, and this is one of the reasons it is the oldest continuous art colony in the US. Cathy drove around the harbor to take a few photos. 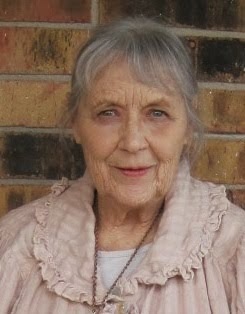 After lunch Peggy and I went to visit her friend Prudence Fish. 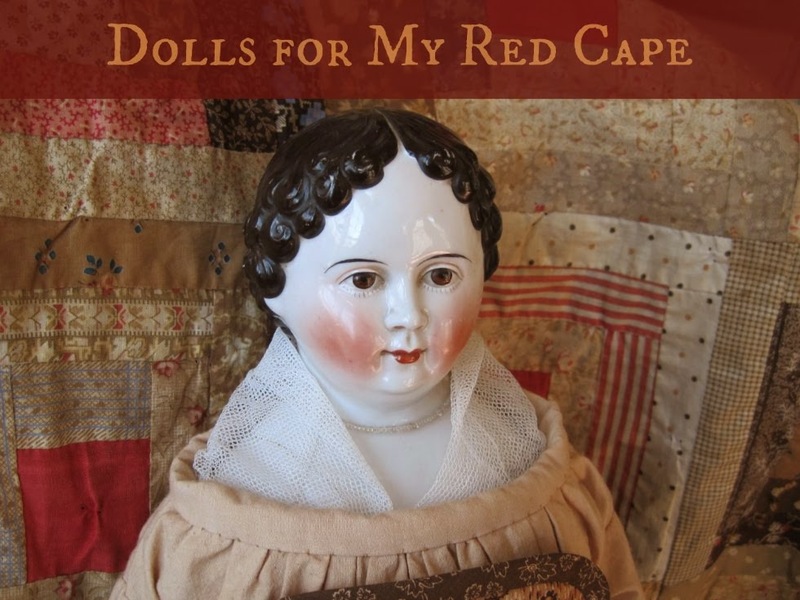 Pru began to collect antique dolls as a little girl. Her mother's older friends began to bring her their dolls, some of them very fine. This built a very good start for her collection. After a bit Pru served tea and snacks and we looked for all the world like 3 little girls having a tea party with the dollies. I guess that is just what we were. After a trip to the health food store, like no other I have seen, Peggy stopped in Gloucester for me to reserve a space on the schooner Thomas Lannon next Friday for a cold sunset sail just around in the harbor two hours. This was a day at Peggy's house watching her make a bonnet for a doll that may be mine if I am very lucky. 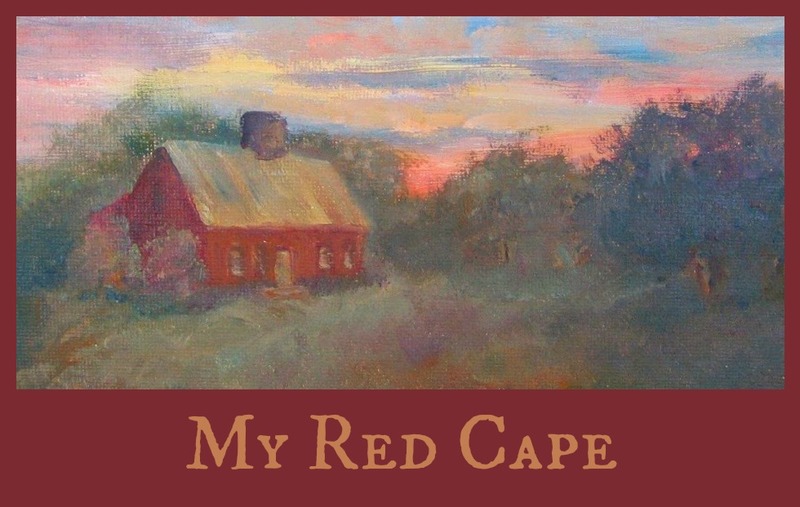 Her fingers worked the straw braid deftly, and by and by, there was the brim of an 1840 style bonnet. Then Dennis made a fire and we ate by the fireside. How sweet it is to be in a dear early cape for long lovely hours. Surely there cannot be many to whom it means so much. I appreciate beyond words that Peggy and Dennis share this with me. 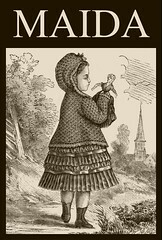 One of Peggy's dolls is pictured below. You can see why I want one. a quiet day in an unforgettable setting. As Peggy was busy with grandchildren, Barbara graciously invited me to spend the day with her. I sat inside some and hooked a bit and also took many photographs. Barbara needed to go to a nearby library, so we enjoyed that drive together, stopping at a busy apple farm. We had apple cider donuts! My first. I also bought a blueberry pie to bring home to my little guest house. Barbara showed me the Parson Cape house and i took pictures outside. Then home to a supper of crackers and cheese and apples of course. Old Homes of New England page 110 ! On Friday Peggy and I drove through Essex and Ipswich as Peggy told stories of the homes we were passing, old houses are clearly her passion. We visited her friend Barbara, mistress of a fantastic first period house filled with an admirable collection. If you have the book above, by Roderick Blackburn then you will know how it was. Walking a little way we were on bearskin neck, a tourist area with quaint shops, our destination was a strudel shop with a small balcony overlooking the harbor. My pastry was cherry strudel. Back to Peggy's house I hooked a little on a small project I will picture for you by and by. Peggy seved a delicious supper of baked haddock and an onion and tomato and cheese tart, surely a cousin to a pizza but in a delicious pie crust she had made early that morning. She added beets lightly pickled and her home made apple sauce. Peggy is a fantastic natural cook, an artist in her kitchen, making everything seem simple and fresh and light. She and Dennis have a fine restaurant in the old part of the city. 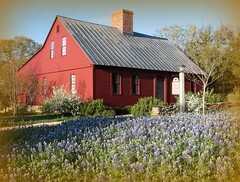 A wonderful early house in Virginia.